The memorial commemorates the courage and care shown by volunteer firefighters during the bushfirres in Victoria in 2009. 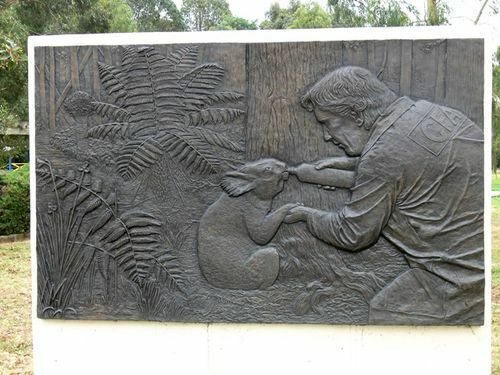 The bronze bas-relief sculpture features a koala (known locally as Sam) receiving a drink of water from a volunteer fire-fighter. There were numerous acts of courage and care shown by volunteers during the terrible fires that spanned Victoria in late January and February 2009. This action by a volunteer during the 2009 bushfires captured the imagination of the world, and epitomises the natural generosity of people in a crisis. The choice of a subject to be developed as the Bushfire Memorial was made by the Mirboo North and District Community Recovery Committee. Funds for the Memorial were provided by the Victorian State Government and the Victorian Bushfire Appeal Fund, and the South Gippsland Shire Council aided the local community by formally commissioning the work and supervising the production. The actual location of this act of generosity was near the Lyrebird Walk, a few kilometres north of the township Mirboo North, and near the epicentre of the bushfires that broke out on 29 January 2009. Mirboo North and District was ravaged by terrible bushfires in late January and early February 2009, as was much of Victoria - including the horrific events known as Black Saturday. There were numerous acts of courage and care shown by volunteers during these fires and this sculpture has been produced to remember one such act ; that of a Koala receiving a drink of water from a volunteer fire-fighter. This action by a volunteer during the 2009 bushfires captured the imagination of the world, and epitomises the natural generosity of people in a crisis. Volunteers from many organisations and thousands of individuals gave selflessly with time, effort, money and gifts to people, communities and wildlife affected by these fires. This sculpture was commissioned by the community of Mirboo North and District and the local committee that re-established the track at the Lyrebird Forest Walk, which is close to the site of the act of kindness shown to the Koala. The sculpture was unveiled on the 29 October 2011. The work was produced by Mr Michael Meszaros, with funds from the Victorian Government and with assistance from South Gippsland Shire Council.